This past weekend I had the good fortune of traveling up to Chicago to attend C2E2 for the second straight year. Not only was the show bigger and better than last year (which was still great), I was able to spend the weekend in the McCormick Plaza Convention Center. I was late to the game booking my room for Saturday night, but had the good fortune of finding a bed in the Chicago Parthenon Hostel. I hadn't stayed in a hostel for over 10 years, but I was stoked to find a bed 3 blocks from the C2E2 shuttle for under $30. On a side note, if you are ever looking for a great place to stay in Chicago I have nothing but great things to say about the Parthenon. After checking in and storing my items in the locker in my room, I walked over to the shuttle pick-up. Nothing gets you more excited about attending a comic book convention than riding a charter bus packed with all types of nerds. There is also something incredibly satisfying about seeing people decked out in elaborate costumes waiting for a bus on a city street. After an incredible pleasant bus ride filled with loud conversations debating sci-fi, comic book characters, and other fun topics, we arrived. crazy! That is a good problem to have) nobody ever seems stressed out at C2E2. At San Diego, creators are stretched so thin that it is tough to engage them in a simple conversation. C2E2 is very accessible for the fans the creators appear to be having a grand time as well. I browsed the Dark Horse, Valiant, Top Shelf, and Quirk Books booths, before venturing into the vendors. There was a noticeable lack of DC at C2E2. Artist alley is normally a crammed space on the floor that is difficult to navigate, but the artist alley at C2E2 was spaced nicely and I enjoyed cruising from row to row. One of my goals is to eventually pay for a commission from one of my favorite artists, but at C2E2 I was able to pick up a print trade of one of my favorite digital comics. I stopped by the Artful Daggers table and was able to chat with the ever pleasant Sean E. Williams who we have interviewed before here at Nerds of a Feather. He was kind enough to sign my book and give me an amazing C2E2 Artful Daggers art card. C2E2 boasted a wide range of panels, covering everything from sexism in comics, a reunion with the cast of The Crow, to your basic run of the mill previews of the upcoming year. I was happy to attend the Minimates panel for the second year in a row and actually won a production sample Spider-Man Minimate that has not been released yet. Score! The panel that surprised me the most was the Marvel panel about its next big event, Original Sins. I am typically not the biggest fan of Marvel events. They are fine and some are quite enjoyable, but after this panel I am very excited about this summer. The Watcher, who has witnessed all of the dark secrets in the Marvel Universe has been killed. It isn't surprising as all of Marvel's dark secrets are revealed. We will learn why Matt Murdock's mom left his family, why Johnny Storm didn't tell Ben Grimm the one way he could return to normal, and more. One of the bigger secrets I am excited about is the fact that the spider that bit Peter Parker bit someone else. Her name is Silk and I can't wait to meet her. As a member of Marvel Unlimited Plus (well worth it! ), I was able to get a ticket to awesomeness. This ticket granted me access to a private panel with @AgentM and some of Marvel's top creators. Prior to the panel those in attendance got to chat with Ryan (@AgentM) and he couldn't have been more pleasant and more passionate about the work being done at Marvel. It is because of this conversation that I am now a fan of She-Hulk and highly encourage you all to check this title out. We were treated to an exclusive Ant Man clip that has me stoked about this upcoming flick, had a special thank you from the cast of Agents of Shield, and learned some interesting details about Marvel's upcoming line. Say what you want about the powerhouse that is Marvel, this panel was a special insight that demonstrated how dedicated and connected to the fans Marvel is. I won't divulge all of the secrets that were revealed at this panel (make sure you are reading Inhuman! ), but I felt like I was really getting a peek behind the velvet curtain and it was a great experience. C2E2 was once again a huge success. Marvel stole the show this year, but I think that fans of comic books are the big winners. 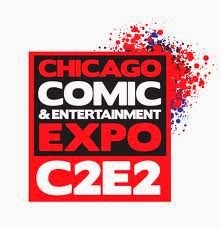 I haven't been to a convention that allows fans and creators to connect in such a meaningful way as C2E2. If you are a fan of comics, there is a great chance that you will get to meet multiple creators that have had a positive experience on your life. Not only will you meet them, but you will likely converse with them and walk away with an autographed book or two. C2E2 is a major comic book convention that is solely focused on the fans. SDCC is overwhelming and daunting, but awesome nonetheless, while C2E2 is a nice gathering of friends that doesn't feel like the cash grab that is a Wizard World Convention.